This book was amazing!!! I love anything to do with cybernetics and neuroscience so this was a good pick for me. 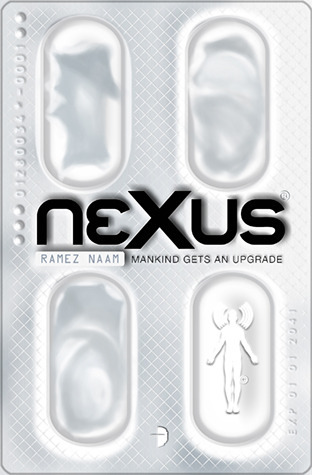 That combined with psychedallic drugs, (no I didn't take any while reading the book - the book is about them, one in particular, Nexus) made for one hell of a ride. Set in the future (around 2040), firstly in the US and later in Thailand. We follow Kaden Lane, a young PhD student who has discovered how to maintain levels of Nexus 5 in his system so that he can communicate with other users via mind-to-mind interfacing. However, Nexus is illegal. The ERD, a US Government organisation a little like the CIA, are responsible for keeping Americans safe from upcoming technological developments, of which Nexus 5 is one of them. There are numerous advances in technology and science in this future world, the ability to regrow limbs with gecko genes, enhanced strength, and mind-to-mind communication to name but a few. So the ERD come down heavy on Kaden and blackmail him to do work for them. Off he sets to Thailand where he meets with like-minded scientists (and buddhist monks) and it's pretty much a fight for survival with everyone seemingly wanting him captured, out of the picture or dead. I really liked the section at the back in which the author discusses the science behind the science fiction in this book and how some of the technology and advancements are not a million miles away from the fiction in this story. Having worked in the IT industry, this author knows his stuff and it comes across in his writing. That said, it's not too technical so you don't need to have a PhD in Computer Science or Cybernetics to understand what is going on. The writing style is very accessible and easy to read. I could not stop reading this book. I have purchased the next in the series and I received the third, Apex, through NetGalley so I can't wait to continue on with the series.